As a luxury hotel expert, I must admit, I was one of those people who cringed at the thought of going on a cruise. With even the mention of the word “cruise”, every stereotype from unpleasant buffets to touristy port stops was enough to keep me away. 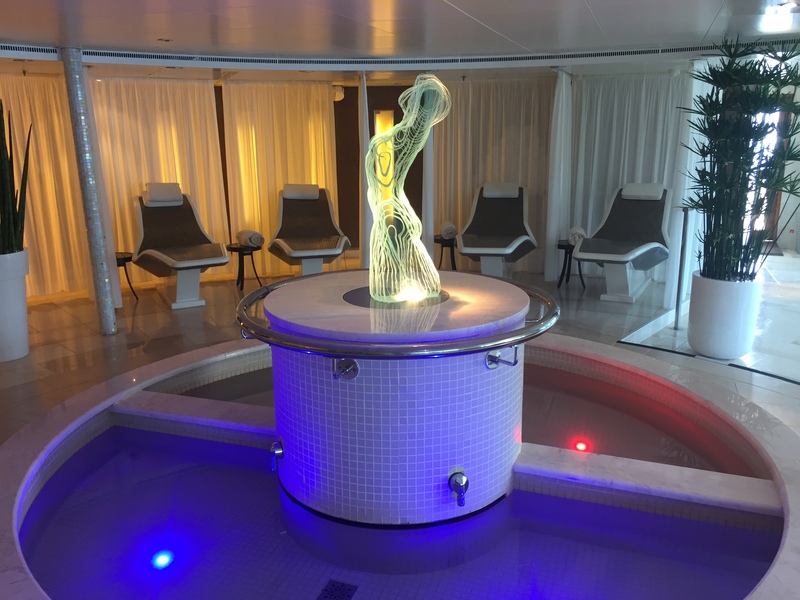 I fancy myself a luxury hotel kind of girl, so when the opportunity to experience a luxury cruise as a guest of Seabourn, I agreed with some hesitation but promised myself to go with an open mind. 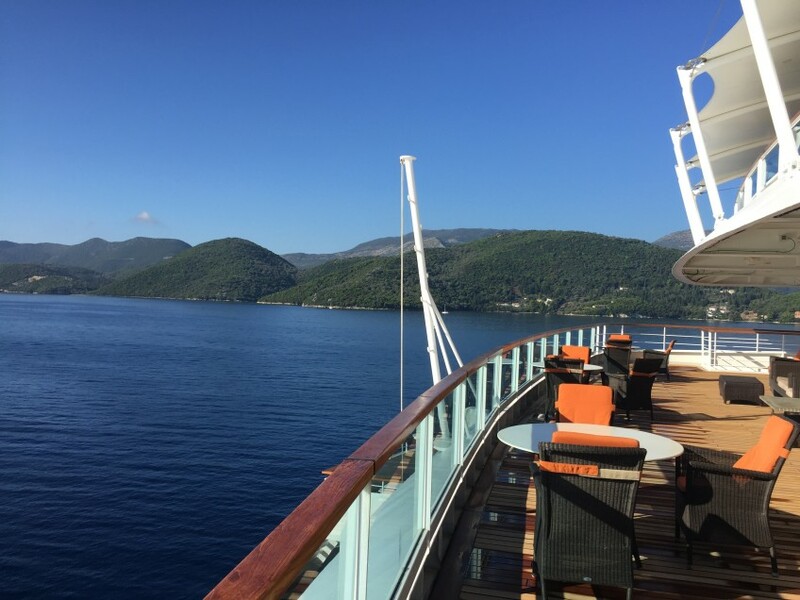 As a first time cruiser, here are the Top 5 things that pleasantly surprised me about luxury cruising, and why I wouldn’t hesitate to go again. 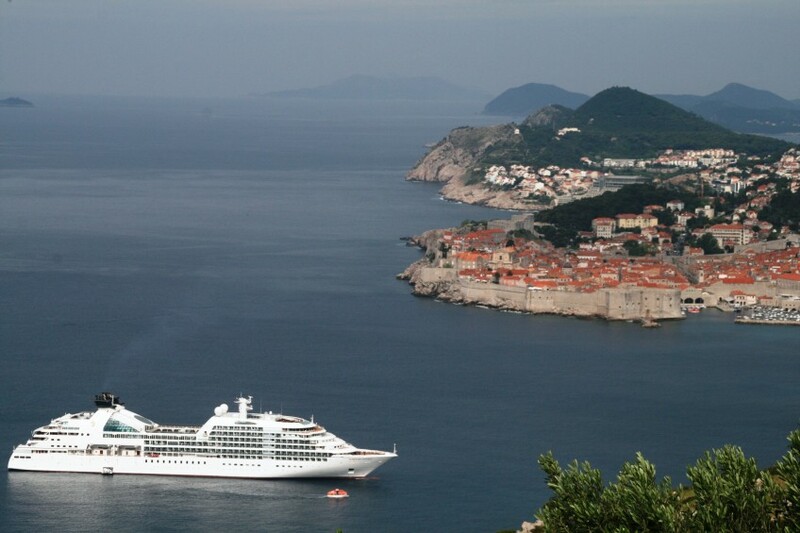 Seabourn Odyssey is an small luxury cruise ship that accommodates only 450 guests in 225 luxury suites. Over 90 percent having their own verandas. One of the biggest surprises we had was just how easy it was to find your way around the ship and just how spacious our luxury Veranda Suite would feel. 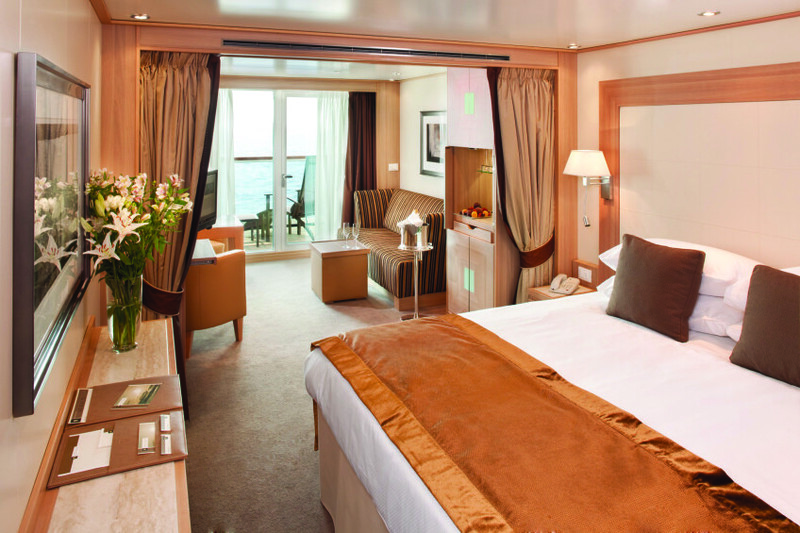 Seabourn Odyssey’s suites range from 295 to over 1,200 square feet. I was fully prepared that space in our suite cabin might be tight and imagined our suitcases becoming side tables. This was hardly the case. Our suite was complete with a king-sized bed, living room with sofa, table, side table and chairs which became a great work space, walk-in closet, marble tiled bath that included a full bathtub and shower and a beautiful ocean-view balcony. In every nook and cranny, we found ample storage space allowing us to fully unpack during our stay. The suite was designed to even include space under the bed allowing us to hide our suitcases away for the week. We found ourselves enjoying endless private ocean views, magnificent sunrises and sunsets with ever-changing landscapes – not something you’d find staying a week in a hotel. It was never the same view day after day. 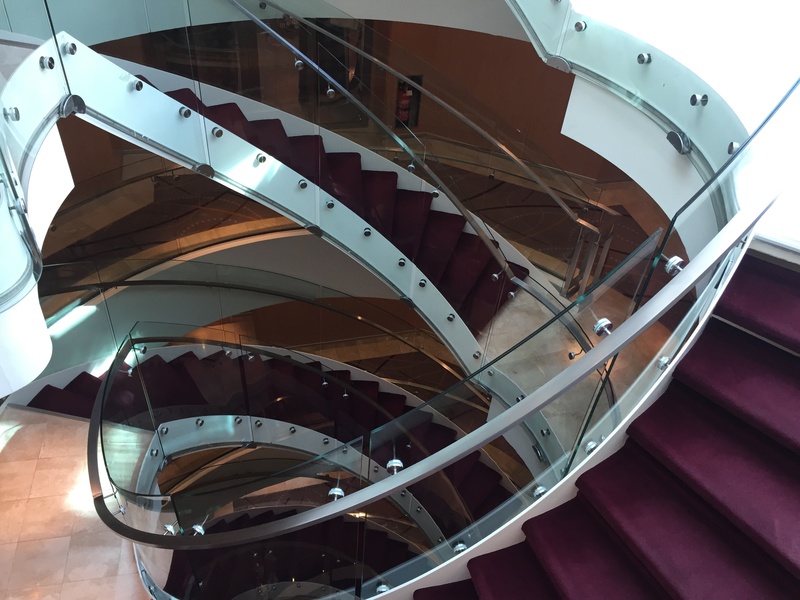 The Seabourn Odyssey never felt crowded, and very rarely did you see other passengers in hallways, elevators or staircases adding to the serene nature of the ship. From the moment we arrived the passenger cruise terminal in Pyraeus, Greece, the service felt welcoming and authentic. The boarding process itself was smooth and effortless. I had visions of being rushed, crushed and pushed on board the ship with thousands of people, one of the many reasons why I had never gone on a cruise ship before. The small luxury cruise ship experience is different. After we checked in, we were greeted with authentic smiles and personalized service. We knew we were going to be in good hands for the week. 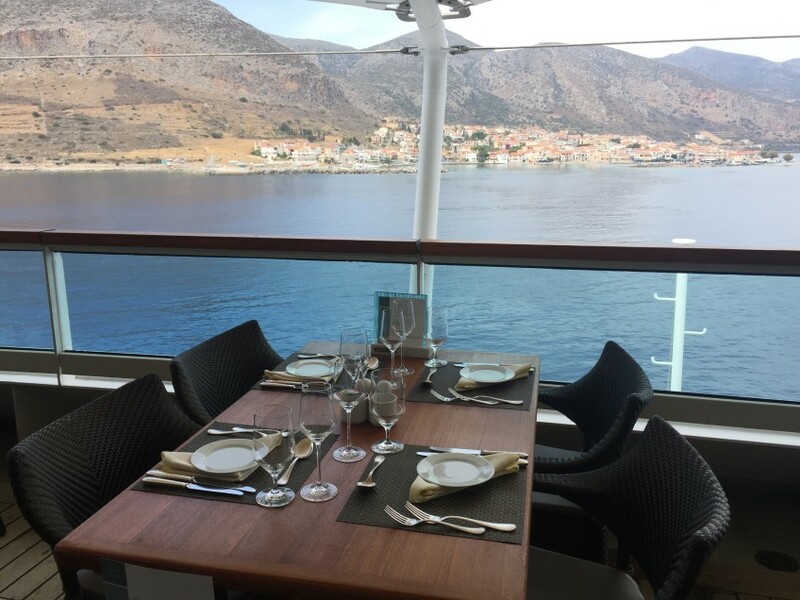 Before we knew it, we were on-board and dining al fresco on the Colonnade restaurant’s terrace overlooking the sea. Not once ounce of stress, and a fantastic first impression. When our suite cabins were ready, with our keys already in hand, we went to our cabin on the 7th floor, and met a lovely South African woman named Lauren, who would be our suite attendant for the week. After welcoming us and showing us around our spacious suite, she presented us with our choice of soaps on a tray from Hermes to L’Occitane and Molton Brown. We were feeling spoiled already. Throughout the week, she would consistently surprise us with personalized touches, recognizing that mom loved mixed nuts, and thoughtfully would bring a bowl each day for mom, and indulging me with my favorite fruits on the daily en suite fruit platter. We found service to be sincere and attentive, and no request was too big or too small. Even in the restaurants, servers began to make note of our favorite drinks and ask if we’d like our favorites the moment we’d arrive. With the small ship size, crew members became familiar faces and always appeared to genuinely enjoyed their jobs. We felt a bit empty having to say goodbye when the cruise ended already missing these wonderful people who made our trip so special. When someone would mention a cruise to me, all I could think of was scary midnight buffets. On Seabourn Odyssey, the dining experience completely changed my perception of cruise ship dining. 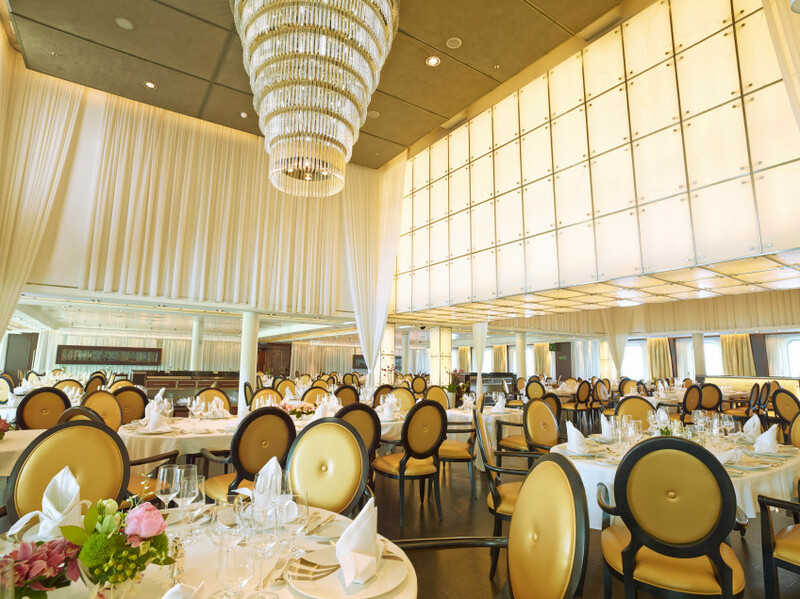 Seabourn has partnered with world-renowned Chef, Thomas Keller of the Michelin-starred restaurants The French Laundry, Per Se, and Bouchon bringing his popular French and American cuisine to this ultra-luxury cruise line. Throughout the week, we never had two dining experiences the same. There were so many choices of restaurants to dine in from the open-seating The Restaurant to The Colonnade for more bistro-style fare and regionally themed-cuisine. You could dine al fresco enjoying the gorgeous ocean views or inside. We found ourselves dining mostly at the Colonnade at lunch with its small-sized themed gourmet buffet and modern dinner setting. We loved the more formal evening at The Restaurant when guests could dress up in more formal wear making for a glamorous evening of fine dining. Restaurant 2 is the most intimate of the dining experiences on board and requires a reservation, so be sure to plan early to enjoy this exclusive small plates tasting menu experience by Thomas Keller. For more casual fare, the Patio offered fresh-baked gourmet pizza to light salads. We even enjoyed room service one evening in our cabin suite. One of the highlights was the lovely coffee bar located centrally in the Square of the ship. You could enjoy a cappuccino and fresh-baked pastries and tea sandwiches in a serene library setting – a lovely perk for passengers, and a central gathering spot of passengers after touring a destination. The dining experience overall had good variety and was memorable. One of the reasons I had always avoided cruises is that I never felt you could authentically see a destination beyond just cruise terminal tourist traps in each port. While our trip did take us into a few of these touristy ports, our pre-planned excursions allowed us to see more of the destination in a short amount of time. Cruises are highly ideal for people who are time sensitive and would like to see multiple destinations in a shorter amount of time. Cruising allows you to avoid additional travel time by sailing overnight and arriving to a new place each day. On our Greek and Dalmation Islands Delights cruise, we visited many charming places that we wouldn’t have easily been able to see on our own if we had flown ourselves including a few of Mom’s favorite’s, Monemvasia, Greece and the charming Primosten, Croatia. 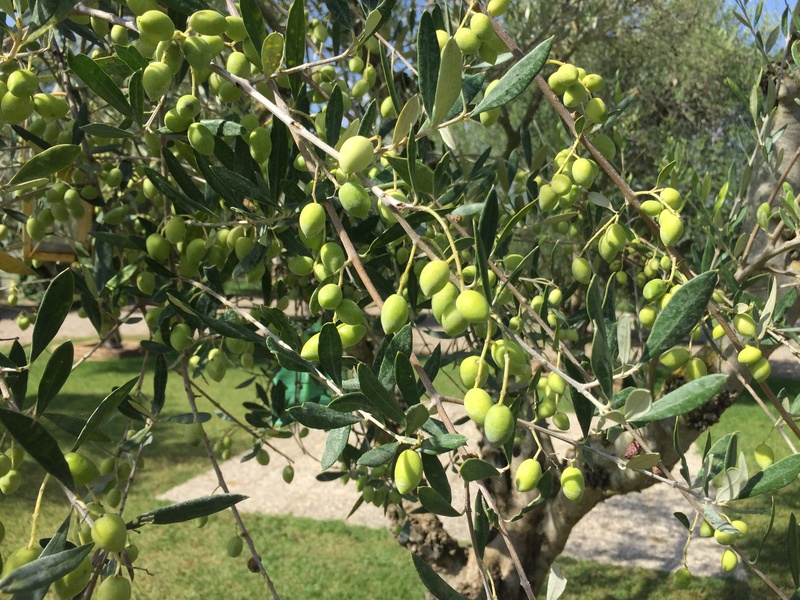 We planned in advance to go on various recommended excursions (which you can sign up online on your Seabourn account before you depart) including a lovely tour of the Magna Grecia farm in Olympia, Greece to see how the olive oil is produced and sample the different kinds of olive oil. We loved this excursion finishing the tour with some lively Greek dancing and a delicious Greek lunch. 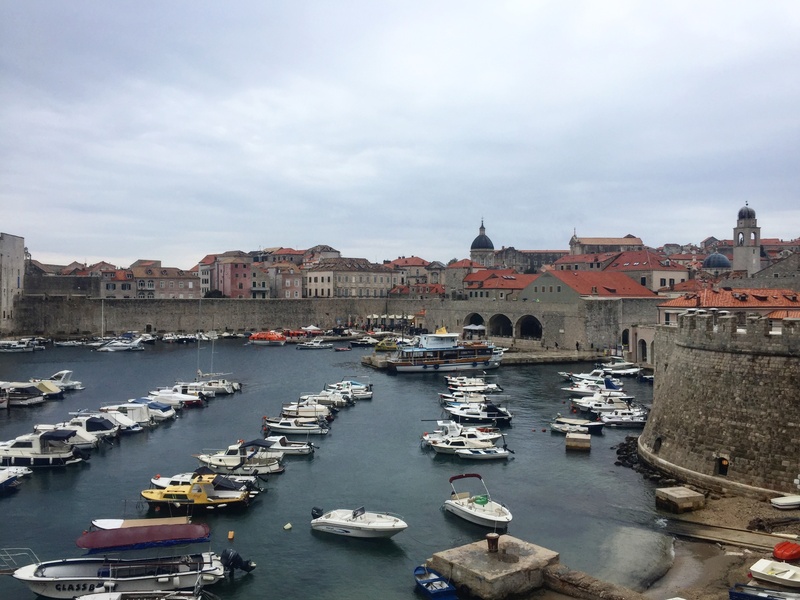 As the week went on, we found ourselves canceling pre-planned excursions so we could meander the Old Towns in Dubrovnik and shop for beautiful red coral in Primosten on our own. 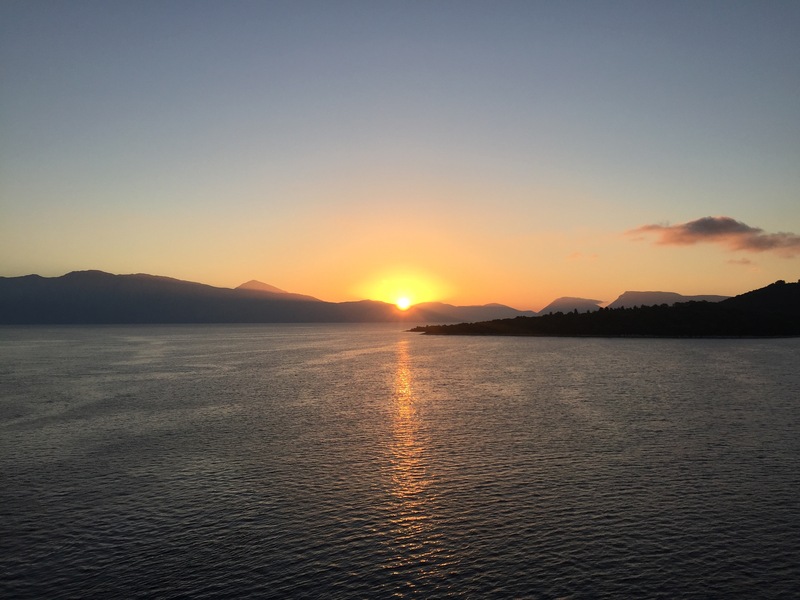 While there were a few places like Corfu, Greece and Dubrovnik, Croatia and its nearby isles and world-renowned beaches that I would have enjoyed seeing more of, it was enough to give me a sample of the destination. Now I know where I will plan a longer on-shore trip in a resort or villa. 5. Just Enough Things to Do! We found the beauty of this type of cruise was you could do as little or as much as you like. 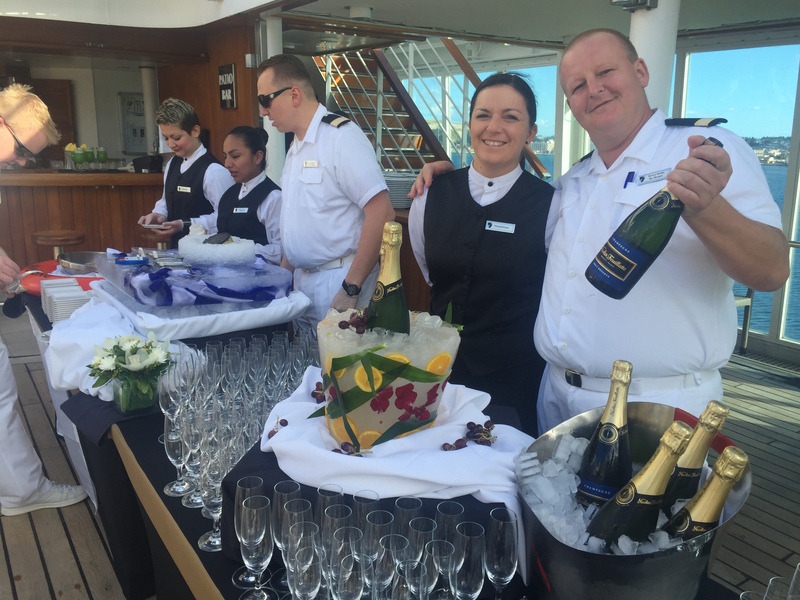 Within a few days we were figuring out how to plan our days with breakfast in bed, then taking the tender to shore to see the sites, followed by lunch on board, a little spa time, pool time and beautiful dinners in the evening. You could enjoy nightly entertainment from music to comedy, a night club for dancing and a small casino – everything was elegant and upscale making for a pleasant experience. I loved relaxing by the beautiful pool with endless ocean views. I would recommend not scheduling a tour every day so that you can enjoy a sea day and experience the beautiful spa. Be sure to visit the on-board concierge in the Square who will assist you with maps and planning your tours and make recommendations on how to maximize your time ashore. Thank you to Seabourn for a wonderful first time on a luxury cruise. We truly enjoyed the small luxury experience and wouldn’t hesitate to go again. 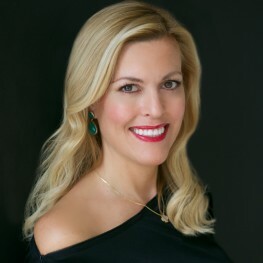 Follow me on Instagram and Twitter at @LuxeTiffany and check out the hashtag #LuxeSeabourn for more insider photos from our luxury cruise on the Seabourn Odyssey.